From mid November 2009 the new smart fortwo electric drive will roll off the production line at the smart factory in Hambach, France. Unlike its predecessor, the electrically driven smart fortwo of the second generation is fitted with an innovative and highly efficient lithium-ion battery. It is housed in a space-saving position between the axles, which means that space is not compromised in any way in the intelligent two-seater vehicle. A 30 kW electric motor is fitted at the rear. This provides for good acceleration and high agility with 120 Newton metres of torque that are immediately available. The smart fortwo electric drive can be charged at any normal household socket. In Germany, a full battery charge costs approximately two euros and is sufficient for a range of around 135 kilometres â€“ more than enough for city traffic. 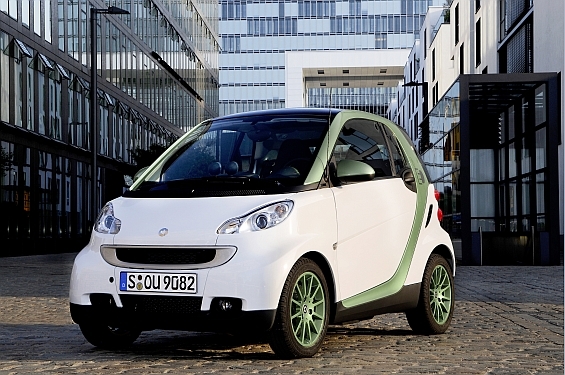 smart has made electric drive a practical alternative for zero-emission mobility in urban areas. The new smart fortwo electric drive is initially being leased to customers in Berlin and other cities in Europe and the USA who will subject the environmentally friendly trendsetter to intensive real-world testing in tough everyday conditions. From 2012 it will be available to anyone interested. A 30 kW magneto-electric motor is installed at the rear of the new smart fortwo electric drive and reacts immediately and without delay. Powerful torque of 120 Newtonmetres is immediately available. This results in a surprising amount of power when pulling away. The smart fortwo electric drive accelerates from 0 – 60 km/h in 6.5 seconds â€“ just as quickly as a petrol model which it initially leaves behind it. Its maximum speed has been deliberately limited to 100 km/h, a suitable speed for the city. Thanks to the power characteristic of the electric motor, the smart fortwo electric drive needs just one single fixed gear ratio. There is no need for any gear changing â€“ a major advantage in dense city traffic. To reverse, the engine’s direction of rotation changes. The second generation smart fortwo electric drive is powered by a lithium-ion battery from Tesla Motors Inc. with capacity of 14 kWh. It is simple to charge at any fused 220 Volt socket. A fully charged battery is sufficient for up to 135 kilometres of driving fun (NEDC). This range is more than enough for city traffic as studies have shown that cars drive an average of 30 – 40 kilometres per day in towns and cities. For this, the vehicle only needs to be charged for three hours. Plugging the car in overnight will fully recharge the battery. The new second generation smart fortwo electric drive is based on the smart fortwo coupÃ©/cabrio passion. As well as air conditioning with automatic temperature control all the equipment features of the popular passion equipment line are included. In addition to the battery indicator, an ammeter shows the consumption and the recuperated energy. Further vehicles of the new generation smart fortwo electric drive will take to the roads of Hamburg, Paris, Rome, Milan, Pisa, Madrid and they will also be deployed in further projects in Europe. Some of the models will also go to cities in the USA.